You’re Invited! 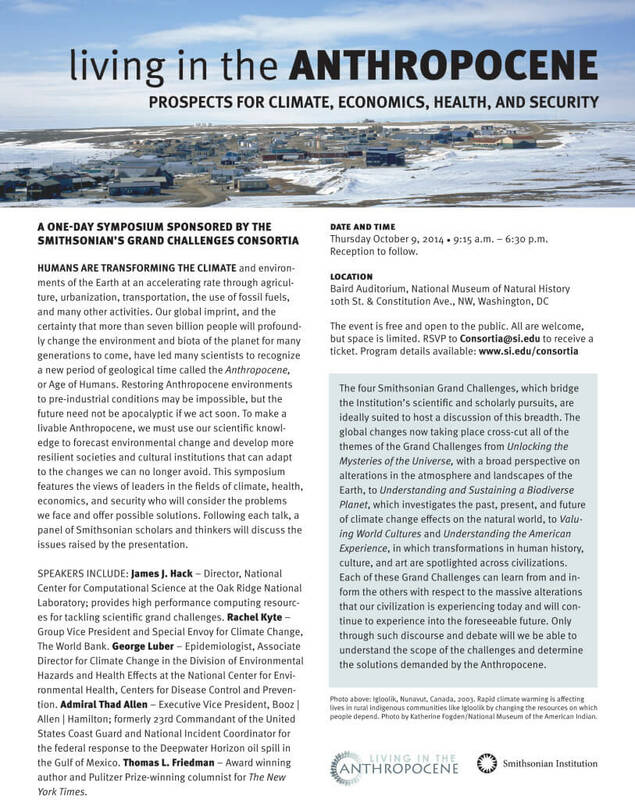 On October 9th, 2014, Drew Jones will be joining the Smithsonian Institute for a plenary session a day-long symposium, Living in the Anthropocene: Prospects for Climate, Economics, Health, and Security. At 2pm, Drew will be giving a plenary interactive En-ROADS presentation around 2pm that will highlight climate successes to inspire grounded hope. The symposium is open to the public, but space is limited. RSVP by October 1st to Consortia@si.edu with attendee name and affiliation to receive your ticket. October 9th, 2014 | 9:15 a.m. – 6:30 p.m.
Can’t make it to D.C.? The symposium will be webcast live and recorded for later viewing. Join us on October 9, 2014!